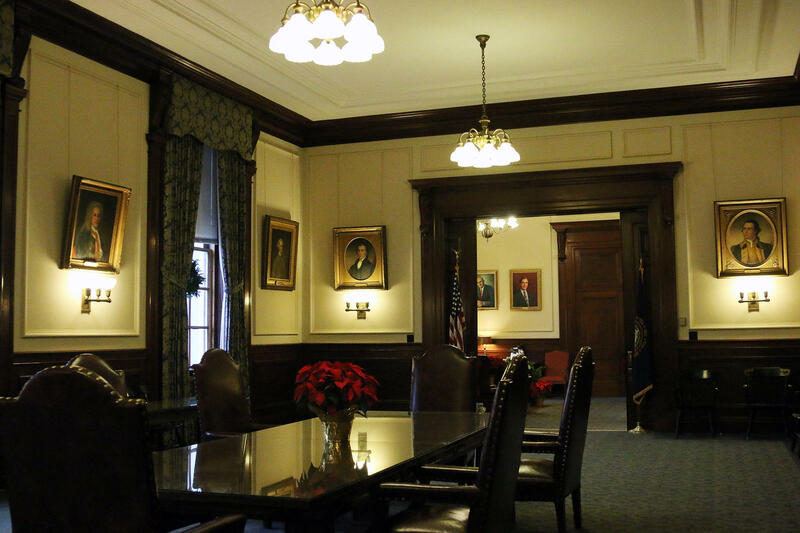 The Executive Council chambers, inside the New Hampshire Statehouse. New Hampshire’s five-member Executive Council flipped to Democratic control in November. We sit down with two newly-elected members to find out what, exactly, the council does and the key issues before it this year. An overview of the Executive Council's responsibilities. The current members of the Executive Council and a map of their districts. A rundown of action taken at the Jan. 9 meeting of the Executive Council, courtesy of Manchester Ink Link. Councilor Mike Cryans talks with the Conway Daily Sun about his priorities in this new role. The Executive Council voted Wednesday to approve the pardon of a man convicted of resisting arrest during an incident at a Newmarket polling place in 2014. Former Newmarket GOP Committee Chair Joe Barton's conviction stemmed from an altercation he had with an investigator from the Attorney General's office during the general election. Barton had allegedly made verbal complaints about a voters eligibility at the poll. At a hearing last week, Barton said he believed his arrest was politically motivated. The Executive Council has voted unanimously to approve more funding for substance-use treatment providers. Part of that money will go toward guaranteeing a reimbursement rate high enough to cover the cost of care. Mental health and substance abuse treatment providers raised concerns earlier this year that rates would drop in 2019 under the new Medicaid expansion program, forcing them to shut down services and beds. The Executive Council has approved a $4.4 million contract to fund a new behavioral health crisis treatment center. The contract, awarded to Riverbend Community Health, will fund a 24/7 crisis center in Concord. It will provide short-term treatment to stabilize patients before connecting them with community mental health resources. Riverbend CEO Peter Evers says the center will be an alternative to emergency rooms for first responders dropping off someone in a mental health crisis.